It doesn't matter what time you choose to do this series. However, it is very beneficial to do this if you are upset about something or feel nervous. If you do The Sun Salutation in the morning, this can be done later when the Moon is rising. If you do this just before going to bed, please read the directions in the end of this series about how to change the movements. Learn the order of the movements until you don't have to think about them anymore. When you reach that stage, your body will flow naturally from one movement into another. Getting upset about not remembering will not help you to remember. Be gentle with yourself until you know every step. Start with Step 1 and then move to Step 2. When you feel that these movements are no longer difficult, move on to Steps 3 and 4. This is a focused way to continue until you have mastered all 14 steps and can breathe in and out of each one appropriately. I suggest that you print out all of the pages for this to help you. It is important to practice on an empty stomach. Now let's get started! Step 1 is repeated in Step 14. Stand with your back straight with your feet hip-width apart. Visualize the spot just above the heart center in your chest. Lift up that spot to get your spine straight and comfortable. This is a little secret that many people never learn. It is the best way to improve your posture without tensing your spine and lifting your shoulders in an attempt to stand or sit straight. Your shoulders should be relaxed as you begin the Moon series. This area is also shown in the Breath series in detail. 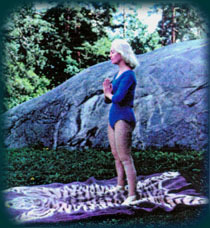 Place the palms of your hands together (as Eugenia shows in the image, above) in front of your chest. Focus your attention on your body and visualize that there is a mirror in front of you (it would be best to have one, of course). You feel stable, balanced and relaxed. If you are not relaxed, breathe slowly until you begin to calm down. Visualize that the positive and negative energies in your body are stable and flowing together. Stretch your kneecaps to keep your knees straight. Contract your hips and then pull the muscles of your thighs up. Hold your tummy in. Whenever you are in a standing position, remember to put the weight of your body evenly on your feet by letting the weight be in your toes and your heels at the same time. Imagine that your feet are like the roots of a tree going deep into the earth below you. Close your eyes and concentrate on the area between your eyebrows. Feel relaxed. Breathe slowly and deeply. Visualize that your next movement will take you into what looks like a half-Moon. If you don't know anything about moon phases, you might want to learn about the 8 Phases of the Moon. It can be quite helpful to understand what you are saluting! This first movement will be repeated in the last step of this series, #14. Step 2 is repeated in Step 13. Inhale slowly as you lift your arms high over your head with your elbows slightly bent and your head and face moving back. Look up as you lift your face and allow your head, relaxed, to follow your arms back, but keep your neck straight as Eugenia shows in this image (left). Note: Be sure that your head is not hanging back to avoid injury in this position. This is not a static posture, but flowing movements from one position into another. Your knees are slightly bent with the soles of your feet connected to the earth below (grounded). Make sure your weight is evenly distributed on the balls of your feet. Feel the spots on the soles of your feet (the kidney point) in the center just next to the inner bulbous spot there. Feel that as you move in the Moon Salutation series. Your eyes can be open, half open, or closed. Do what feels best for you. Feel the stretch in your entire spine as you get ready to move forward into Step 3 of The Moon Salutation. This movement will be repeated in #13.